The curved wall along the left will have a radiator on it before winter, and you can see my walnut worktop along the back wall – this was an Ikea Karlby kitchen countertop that we cut down to the right size (as well as cutting out a hemisphere at the back to thread cables through). It’s jointly supported by wall brackets and two adjustable legs. On the left by my coverstitch is a 120 spool thread rack that I spray painted white and have since mounted on the wall after these photos were taken. 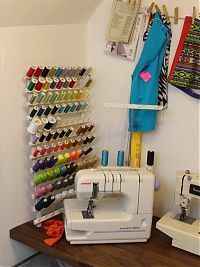 You can also just see at the top that I’ve found the clothes line above my machines to be so indispensable for dealing with pieces of works in progress that I’ve moved it over from the old sewing room. Can’t sew without it! Not pictured, but underneath the worktop on the right is a little red IKEA Helmer chest of drawers which has held all my smaller haberdashery like zippers, elastics, ribbons, buttons, etc for quite a few years now. It’s a bit hidden under the worktop, but I know where everything is in there anyway by now. Rotating around to the right you can see the biggest object in the sewing room, an IKEA Stuva wardrobe to which I’ve added a bunch of internal shelves and doors and which was so big we very nearly couldn’t get it into place (cue frantic disassembling and hacking together to squeeze it in, ultimately meaning I had to leave the top set of doors off since the ceiling slopes doward with the deck above!). 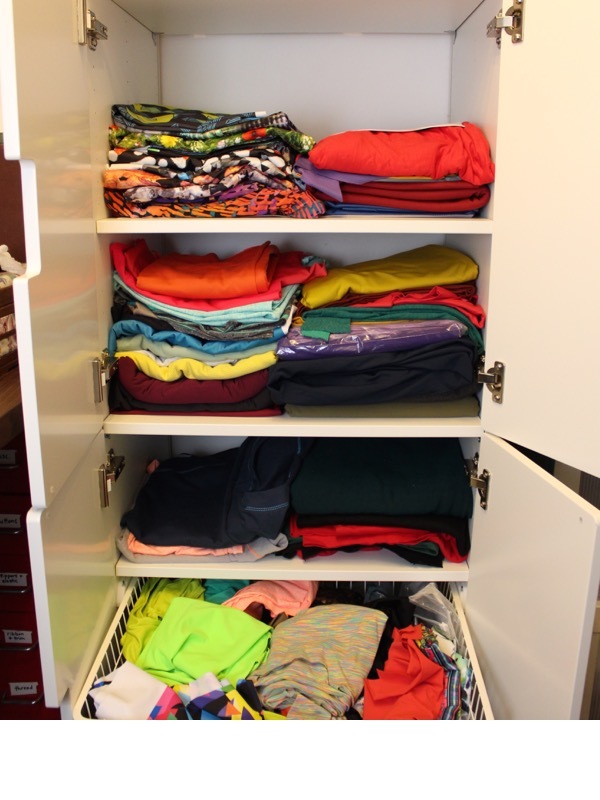 Pictured above is just my lycra/activewear stash and I love the basket drawer which contains all my weird little lycra scraps for colourblocking. These were previously in a plastic bag in my old room and it’s much easier to find stuff now! I’m also proud to say that my woven and “casual knits” stashes are small enough to only occupy one shelf each (up by the ceiling). To the right of the stash wardrobe is an old IKEA chest of drawers I’ve had for a few years, which holds my envelope patterns, lingerie stash, and various other small bits of fabric that aren’t activewear. 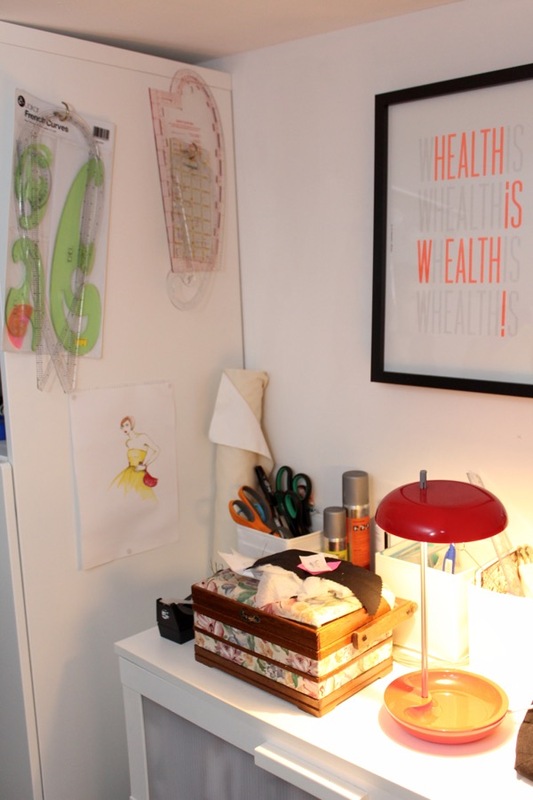 I’ve turned the side of the wardrobe into storage for my drafting tools and I finally have a place to showcase my Rosie Lee “Health is Wealth” lithograph which is pretty much my mantra. 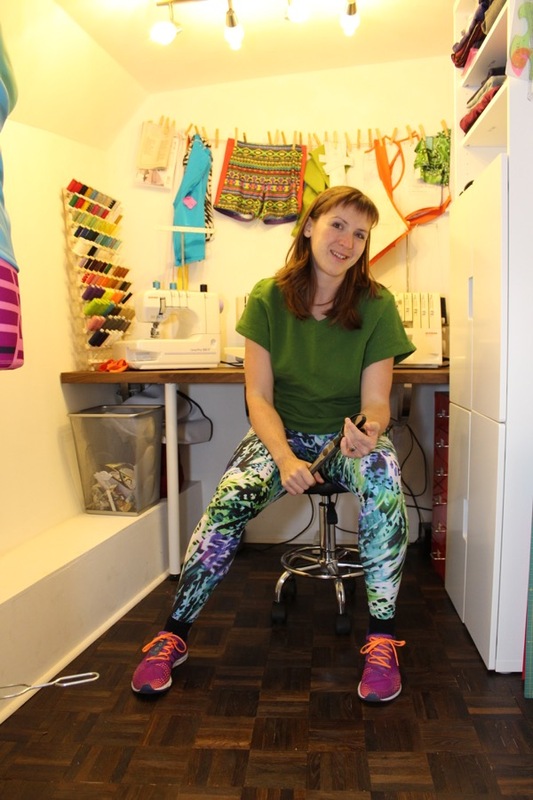 Where were you sewing before? I’m glad you asked! 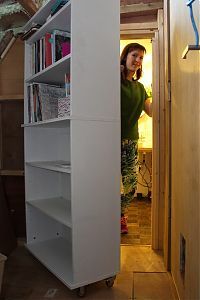 You can see some photos I took just after we moved onto the boat 8 years ago here, ooooooorrrrrr, because I love you all, I actually filmed some Before & After videos so you can compare my old, temporary space with my new sewing space! It’s about 6:30min in total and the new room starts at about 3:50min in if you want to skip straight to that bit! 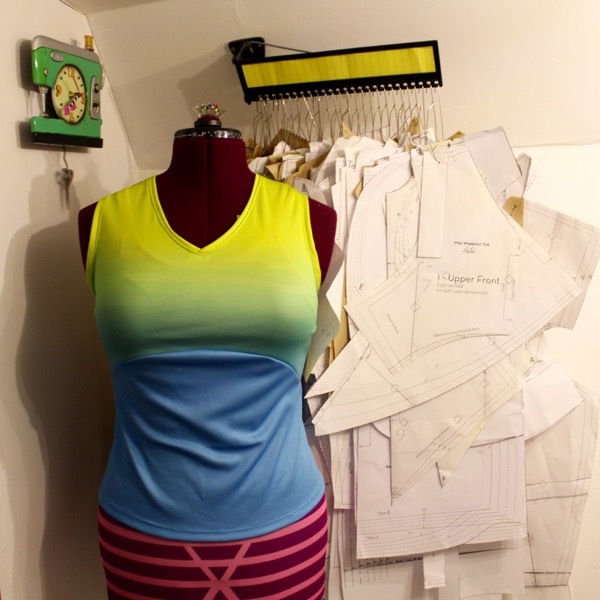 Where do you cut fabric? I use the desk up in the saloon (living room) to cut all my fabric. It’s just wide enough to hold folded 150cm width fabric, though I do have to clean off James’s stuff a lot of times as it becomes a bit of a dumping ground. 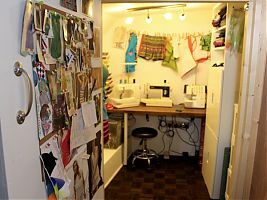 My iron and ironing board are currently in the corridor outside my old sewing room, but when the renovations are complete, my pressing station will be in the corridor outside my new sewing room. Which, umm, currently houses Nishi’s litter tray. Don’t you have a lot of pattern magazines? Where are they? Well spotted – as a long time pattern magazine subscriber, I’ve got a lot of magazines stretching back over the past ten years! I diligently scan the “At a glance” page for each issue (or create one if it doesn’t exist) and store these online for me to easily browse through. The magazines themselves are now in our storage hold, with one of these boxes holding approximately 3.5yrs of Burda magazines. 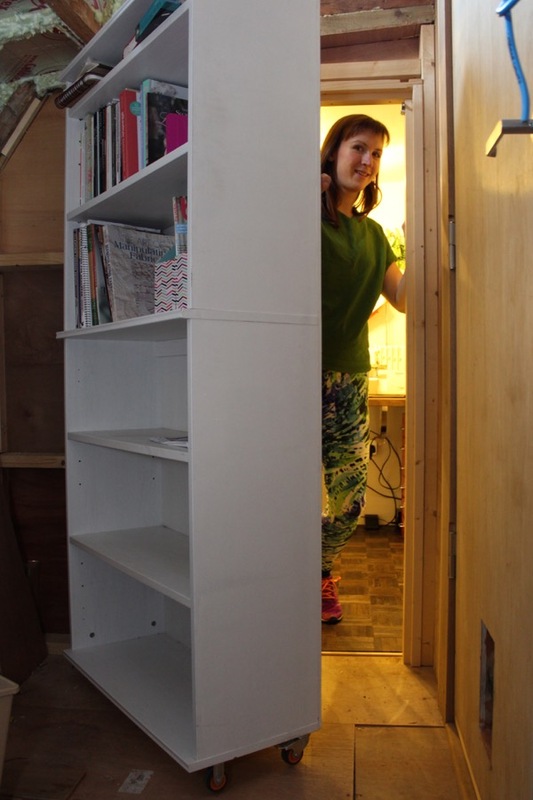 These will be ultimately stored in the corridor outside my sewing room once it’s finished and the shelves are up. Don’t you find it cramped? And dark with no windows? Nope! I love my little room! I love that I can sit on my little swivel stool (designed for beauticians & tattoo artists so comfy for sitting for long periods!) 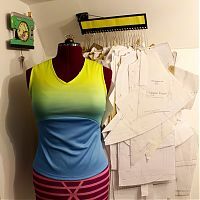 and easily scoot between my three main machines (sewing, overlocker/serger & coverstitch) and grab supplies from elsewhere in the room without getting up. I love that I can shut the door and know I’ll be finding everything in the same place and be able to sew in little 10min snippets here and there. The lack of windows doesn’t really bother me, either – our bedroom and saloon are really bright and airy, so I can do delicate work in natural light there if I want, but the LED 24v lighting (fed by our solar panels so free!) gives me plenty of light, and, frankly, I like that I can be in the zone for hours without noticing the passage of time! Just for the avoidance of doubt and/or new readers, I want to point out that our boat itself is enormous – it’s just my sewing room that is small, and that we’re still very much renovating the rest of the boat so that’s why it looks like a building site in the background of some photos/videos. 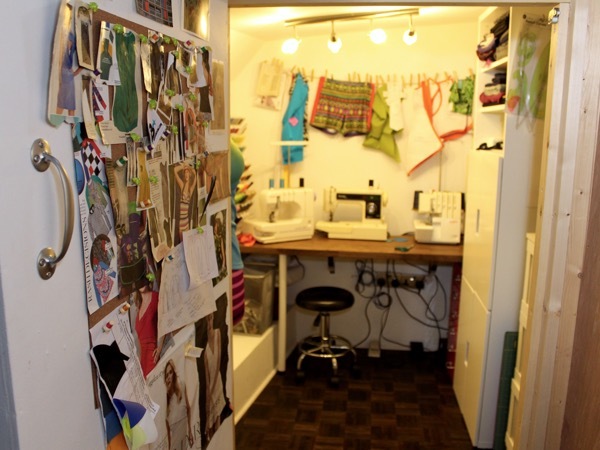 I really do keep my sewing room as impeccably tidy as it appears in these photos, though. I thrive on organised, clean spaces!! Separator image Posted in Inspiration and tagged with fehr-trade-patterns, ikea, reflections, shopping.